In the Old West of America a cowboy lived and died by his wits, his gun, and sometimes his play of cards. The legend goes that one such cowboy, Wild Bill Hickok, was shot dead in cold blood in the midst of a hand of poker. His cards spilled out, showing two Eights and two Aces. Whether or not he would have won the pot is unknown, but this poker hand has forever been labelled the Dead Man’s Hand, and is considered an ill omen at the card table. The Dead Man's Hand and other card SuperstitionsIt is pretty easy to see why ill luck was ascribed to the Dead Man’s Hand, although the missing fifth card in the story makes it possible that someone dealt Aces and Eights has only a one in thirteen chance of getting the actual hand- and how would they know? This is far from the only superstition that comes along with playing cards. Card games are built at least in part around luck, so it would make sense that gamblers would come up with all manner of superstitions dealing with playing cards. If you find yourself with a bad run of luck at the game, reseating yourself is supposed to change your luck. Getting up and then taking your seat again, sometimes after spinning the chair around and then straddling it backwards, is supposed to give a player a fresh start. Of course the brief exercise could also serve to clear a player’s head and help them focus on the game at hand. During the course of a game a player getting a run of spades in all their hands is said to be facing a bad fortune outside the game—endless spades supposed heralds death itself. 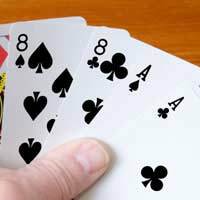 Whistling or singing during play, playing on an uncovered surface, dropping cards are all considered bad luck; or perhaps the superstitions here were created by fellow poker players who were tired of the distractions come from whistling, cards sliding off the table, and butter-fingered players who might also be trying to cheat. Of course there are some things the poker player in the know can do to give him or herself good luck. Blowing on the cards while shuffling them is supposed to “fetch” good cards to the dealer, as is fanning through the deck and touching a favorite card with the right index finger. Waiting to pick up the cards until they are all dealt staves off bad luck (as well as giving away what you are holding by your reaction) as well.Final ThoughtsIn addition to the Dead Man’s Hand there are a few famous legends and superstitions associated with specific cards or hands. The four of clubs is known as the Devil’s Bedpost, and is considered ill to get in the first hand of a game. A bit more specific is the nine of diamonds, which can be seen as similar to the family crest of Dalrymple’s of Scotland, perhaps the source of the legend that John Dalrymple wrote “Kill them all” on this card and thus ordered the Glen Coe massacre of 1692.